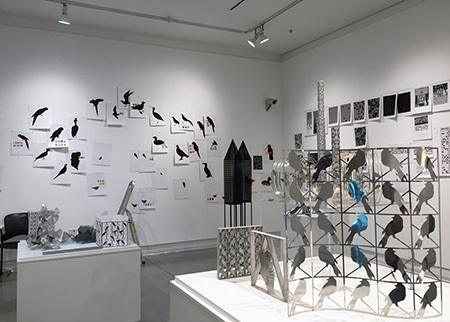 It is sculptor Elizabeth Turk’s thinking process, rather than her intricate carvings that draw our attention in “ThinkLab LIVE .002: Extinct Bird Cages”. Best known for her incredibly delicate hand carved organic marble forms of empty Mobius ribbon cages and undulating ruffled collars, the artist is here a form-maker ironically engaged in a study of absence. The gallery’s space itself actually functions as a container for emptiness; an exposé of an artist-researcher’s willingness to remain wide open to all the thoughts coming in from materials, outside dialogues, research and observation as she actively works with her hands experimenting with forms to visualize species whose memorial presence now is only as something now gone. It’s a compelling inquiry in Turk’s hands. How can materials and solid forms define an artwork’s presence but still allow room for the observer to tangibly experience it’s disappearance? Christian Boltanski used installations of lamps, photographs and rusted metal boxes to summon the dead. Blank pages randomly drifting down inside an empty gallery space rendered the artist and narrative meaning absent but felt presences of Ann Hamilton’s ‘corpus’ installation back in 2004. Working with silhouettes of vanished California bird species, and meditating on the idea of a cage as a hollow space from which only sound escapes, until it too is empty, Turk ruminates on vacancy. In the gallery she leaves a trail of notated images pinned on the wall, moving gradually into and out of three dimensional test forms while playing with reflections, light, shadows and more. This exhibit is about her mental process and not the final large-scale work that will ultimately be installed at the Catalina Island Museum in 2019. There is a pregnant sense of anticipation to the room’s lack of specific outcome. It’s an unexpected emotional lift coming from a subject that should be bound to feelings of loss.